You often see flaws in the metal blanks used to strike coins but rarely do you see coins so obviously wrong as the clamshell error. These planchets contain lamination problems deep inside the metal which splits the 2 sides apart with only a hinge holding the coin together. While not always possible to store these in a 2×2 holder I have seen these stored in flip top coin boxes as they are very much 3 dimensional objects. 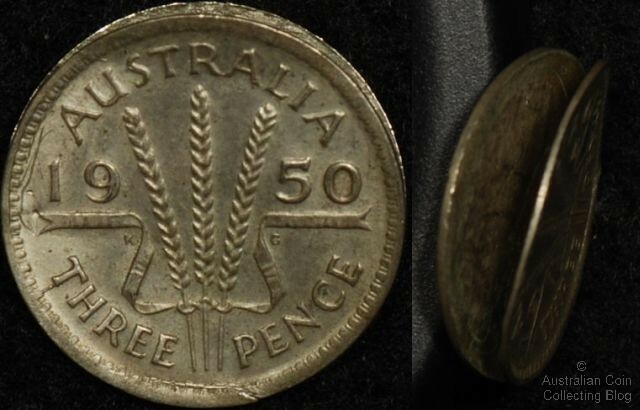 The Australian threepence seen above has probably seen some human involvement to prise the 2 sides apart, but never the less an interesting example of this type of planchet defect error. The lamination flaw, weakness or impurity ran through the centre of the coin allowing it to split open. The flaw may have been caused by the alloy not being mixed properly when the blanks were being prepared or a foreign material or gas being trapped inside the blank as the sheet metal was being rolled. If the weakness ran through the entire body of the coin and each side of the coin became separated it would end up looking like a complete split planchet coin.